Sour cream and crabmeat wrapped in a spring roll wrapper and deeped fried. Marinated chicken with fresh herbs and spices, vegetables and bean thread noodles,wrapped in rice paper and deep-fried. Fresh wrapped steamed shrimp, vegetables and bean thread noodles,wrapped in steamed rice paper and served with a peanut sauce. 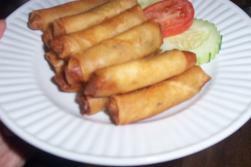 Spring rolls stuffed with mixed vegetables and bean thread noodles, deep fried and served with sweet and sour sauce. Chicken wings marinated in a special house sauce and deep-fried. 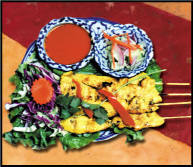 Marinated chicken with fresh herbs and spices, grilled, served with cucumber salad and peanut sauce. Grilled Shrimp served with a special Jasmin hot sauce. Marinated prawns wrapped in paper crepe, deep fried and served with sweet and sour sauce. Comes with 2 spring roll, 2 Cheese rolls, 2 fried shrimp, vegetable spring roll, summer roll and Thai roll. Fried bean cake served with sweet and sour sauce. Marinated chicken with vegetables, herbs and spices, wrapped in a dumpling shell and deep-fried. Grilled strips of beef mixed with lettuce, tomatoes, onions and cucumbers in a fresh Hot Pepper and lime juice. Grilled strips of beef on a bed of lettuce served with a Hot Chilli house sauce. Tasty bean thread noodles, fresh sliced chicken, tomatoes and onion on a bed of lettuce seasoned with a Hot chili paste house sauce. Ground chicken mixed with chopped onion and lime juice, crushed toasted rice, lemongrass, and red chili, served with fresh lettuce. Grilled strips of beef with crispy rice, mixed onions on a bed of lettuce served with a Hot Chilli house sauce. Spicy Calamari salad with lemongrass, onion, mint leaves, fresh Hot Peppers and lime juice on a bed of lettuce. Grilled shrimp salad consisting of crispy rice,chopped onion, lemongrass, Thai herbs and hot chili, served with fresh lettuce. Traditional Thai salad made with green papaya, tomatoes, and dried shrimp with spicy lemon dressing. A tart and spicy combination of shrimp, scallops, mussels, and calamari, mixed with onions, tomatoes, and lettuce in a Hot Spicy house sauce. Stir-fried chicken with garlic and black pepper served with vun sen noodles, green onions and lettuce with a sweet, Hot Spicy house sauce. Chicken with coconut milk, galanga, lemon leaves, chili and lime juice. Shrimp with coconut milk, galanga, lemon leaves, chili and lime juice. Spicy chicken soup with lemongrass, mushroom,lemon leaves and limejuice. Spicy prawns soup with lemongrass, mushroom, lemon leaves, chili and limejuice. Rice stick noodles with your choice of Chicken, pork, beef or beef balls. A combination of clams, shrimp, calamari, chicken and rice stick noodles. A tart and spicy shrimp, chicken, beef and calamari combination soup with bean thread noodles and vegetables. A tart and spicy shrimp, scallops, calamari and fish fillet combination soup with galangal, lime leaves, lemon grass, mushrooms and lime juice. A Chicken soup with wheat noodles and vegetables. Pork wonton and vegetables in a chicken broth. Your choice of chicken or pork served with cucumbers and lime wedge. Your choice of shrimp or calamari served with cucumbers and lime wedge. Beef,chicken,and shrimp served with cucumbers and lime wedge. Pineapple and your choice of chicken, or pork served with cucumbers and lime wedge. Sauteed noodles with chicken, egg, bean cake(Tofu), and bean sprouts topped with crushed peanuts. 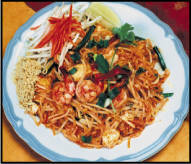 Traditional Thai sauteed rice noodles with choice of beef, chicken or pork, egg and broccoli. Chicken sauteed with bean thread noodles, carrots, onions, broccoli and tomatoes. A traditional Thai soft rice noodles and broccoli stir-fried with your choice of Beef, Chicken, Pork or Shrimp served in a brown gravy. A traditional Thai spicy hot noodle dish of soft rice noodles mixed with green chili, broccoli, and basil with choice of Beef, Chicken, Pork or Shrimp. Combination seafood sauteed with broccoli and cabbage and garlic in gravy. Your choice of chicken, beef or pork cooked in a spicy red curry and coconut milk sauce with green beans and carrots. Spicy green curry made from fresh green chili cooked with coconut milk, sweet basil, bamboo, green bean and carrots. Beef in a yellow curry with potatoes, onions and carrots. Sauteed chicken breast marinated with garlic, black pepper and vegetables. Chicken sauteed with basil, bamboo shoots and hot chili sauce. Sauteed chicken with mixed vegetables and Hot peppers in a bean sauce. Sliced chicken sauteed with fresh ginger, onion, and dried mushroom. Sliced chicken sauteed with fresh vegetables and cashews in a light sauce. Marinated chicken deep-fried and served on a bed of lettuce with a HOT sweet and sour sauce. Sliced chicken sautéed with fresh broccoli and carrots in a light sauce. Chicken with assorted vegetables and pineapple sauteed in a sweet and sour sauce. 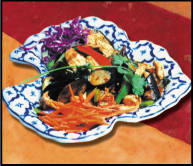 Sliced chicken sauteed with fresh vegetables and lemon grass. Chicken brest battered, deep-fried and served with a lemon sauce. Chicken battered and deep-fried with a sesame sauce, with fresh steamed broccoli on the side. Sauteed pork with mixed vegetables and Hot peppers in a bean sauce. Pork sauteed with chili, basil and onions. Pork sauteed with garlic, black pepper, onion, napa and mushroom. Sliced pork sauteed with fresh ginger, onion, and dried mushroom. Thai style sweet and sour sauce with pineapple and assorted vegetables. Pork ribs, marinated and fried, served with sweet chili sauce. Sliced tender beef sauteed with fresh mixed vegetables. Tender beef, sauteed with fresh chili and hot chili sauce. Tender beef, marinated with garlic and black pepper. Tender beef, Chicken and shrimp stir-fried with vegetables in a light sauce. Tender beef, stir-fried with broccoli and carrots in a light sauce. 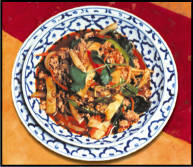 Beef sautéed with basil, bamboo shoots and hot chili sauce. Deep-fried whole fish covered in a spicy herb sauce. Deep-fried whole fish covered with vegetables in a ginger sauce. Your choice of Prawns or calamari sauteed with vegetables and hot chili sauce. 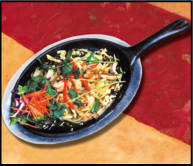 Your choice of Prawns or calamari sauteed with basil, bamboo shoots and hot chili sauce. Your choice of Marinated prawns or calamari and vegetables in garlic sauce. Sauteed shrimp, with cucumbers, tomatoes, onions and pineapple in a sweet and sour sauce. Sauteed shrimp, black mushrooms, bean thread noodles and onions in a special house sauce, served in a clay pot. Steamed seafood combination and mixed vegetables in a curry sauce with red hot chili, coconut milk, and lemon leaves. Marinated prawns, calamari, Chicken, beef and mixed vegetables Sauteed in a light house sauce. A delicious combination of Shrimp, Scallops and Calamari sautéed with vegetables. Shrimp stir-fried with green onions and eggs in a Lobster sauce. A delicious combination of seafood sautied with vegetables in a spicy red hot chili past. Crab stir-fried with scallion and butter. Crab stir-fried with yellow curry. Sauteed mixed vegetables and tofu in a light house sauce. Sauteed mixed vegetables and tofu in a red curry sauce. Vun sen noodles, red onion, green onion, cilantro, crispy tofu, and chili in lime juice. Sauteed broccoli in oyster sauce. Tofu sauteed fresh ginger, onion, bell pepper, mushrooms with bean sauce. Tofu sauteed with fresh chili, green onion and basil. Sauteed tofu mixed vegetables,and cashews. Sauteed Thai noodles with tofu mixed vegetables, bean sprouts, green onion and crushed peanuts. 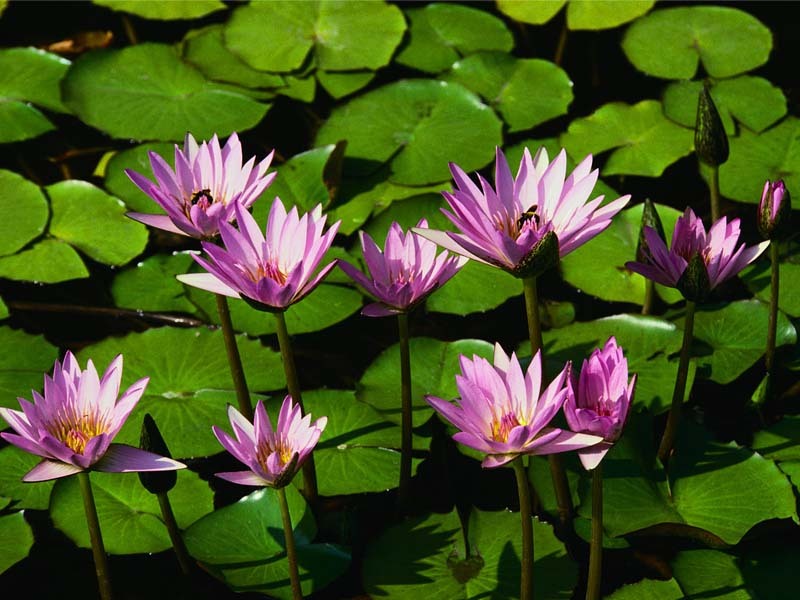 Dinner special are served from 3 PM to 6 PM with soup of the day, steamed or fried rice, 2 spring rolls, for dine-in only. Beef can be chosen for an additional $1.00. To go does not come with soup of the day. Chicken and vegetables stir-fried with bean thread noodles. Rice noodles stir-fried w/ Chicken, egg onion and bean sprouts. Choice of chicken, or pork stir-fried w/ basil, onion and Hot Peppers. Choice of chicken, or pork stir-fried w/ ginger and vegetables. Choice of chicken, or pork stir-fried w/ garlic and vegetables. Chicken stir-fried w/ cashews and vegetables. Choice of chicken, or pork cooked w/ green curry and vegetables. Chicken, or pork cooked w/ red curry and vegetables. Chicken stir-fried w/ lemon grass and vegetables. Beef, chicken and shrimp stir-fried with vegetables. Chicken battered lightly and deep fried with a lemon sauce on the side. Chicken or pork stir-fried with cucumbers, tomatoes, onions and pineapple. Chicken, or pork stir-fried with broccoli and carrots. Vegetables stir-fried in a light sauce. Shrimp stir-fried with vegetables in a light sauce. Choice of chicken, or pork stir-fried with Hot Peppers and vegetables. Shrimp stir-fried with vegetables in a special house sauce. Choice of chicken, or pork and vegetables in a rice noodle soup.Does not come with rice or soup of the day. Shrimp, squid, chicken, beef and vegetables in a rice noodle soup.Does not come with rice or soup of the day. Shrimp, squid, mussel and vegetables in a rice noodle soup.Does not come with rice or soup of the day. A combination of the above pad thai and panang. Does not come with rice. Tilapia fillet served with a ginger sauce or a curry sauce, a salad and steamed vegetables. Does not come with rice. Chicken in a Yellow curry sauce, with potatoes, carrots and onions. Shrimp, Scallops and calamlri stir-fried with mushrooms, carrots, onions and broccoli in a light sauce. Grilled chicken mixed with vun sen noodles and carrots on a bed of lettuce. Does not come with rice. Chicken breaded deep fried and then mixed in a house sauce and severed with broccoli. 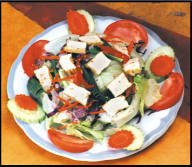 Please call 210-615-6622 for reservations, take-out, or delivery.